Remember that one time Optimus Prime turned into the TARDIS? Okay, so it never actually happened, but I bet we all wish it had. 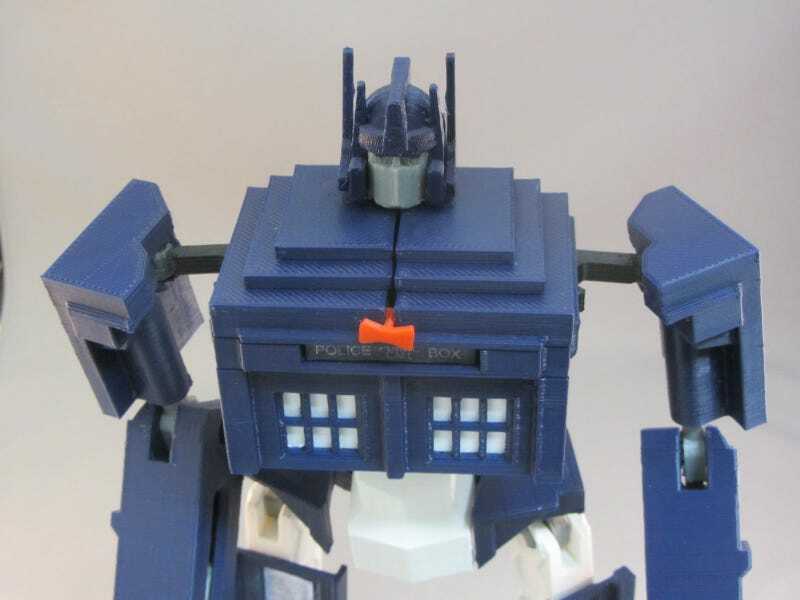 Even though this event never actually occurred does not mean you can't enjoy having an action figure of TARDIS Prime. That is, as long as you own or have access to a 3-D printer. The maker of this particular wonder is Andrew Lindsay. He took inspiration from a t-shirt design by Jason Casteel, and planned out the toy in AutoCAD. It's fully 3-D printable and requires no glue or screws. Shame it cannot be licensed to be sold. Looks to be as good as any other Transformers toy I've come across. Definitely looks easier to use than the original Optimus Prime toy with the trailer. He does offer the Auto-CAD plans so people can make their own. If I only had a 3-d printer of my own. Ah, well.